Dire wolves may be extinct, but would-be Starks can own the next best thing for a mere $3,000. Though dire wolves have been extinct for thousands of years in the real world, Game of Thrones fans know that they make great pets. Who wouldn't want a furry companion as loyal as Ghost or as protective as Grey Wind? You may not be able to go to a pet store and pick out a dire wolf of your own, but you can get the next best thing: an American Alsatian bred by The Dire Wolf Project. The long waiting list and $3,000 price tag might be off-putting, but who can put a price on having a pet that looks like it's straight out of an epic fantasy tale? 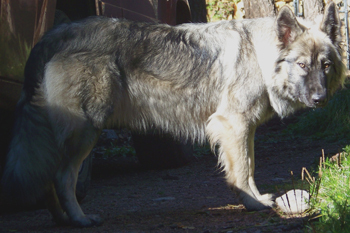 The Dire Wolf Project has been around since the late 1980s, and was started "to bring back the look of the large prehistoric dire wolf in a domesticated dog breed." The project has gotten more attention lately thanks to the popularity of George R.R. Martin's A Song of Ice and Fire series, as well as the HBO TV show adaptation Game of Thrones. The American Alsatians aren't actually descendants of dire wolves; there aren't any surviving samples of genetic material of the species. Instead, breed founder Lois Schwarz set out to make a pet that was wolf-like in appearance, but practical as a family pet. At around 130 pounds when fully grown, American Alsatians are bred to be intelligent, alert, and fond of human contact. The Project's website states that its mission is not yet complete, with one eventual goal to achieve a lifespan of 15 to 20 years for the American Alsatians. If you happen to be in southern Oregon, you can "observe, photograph, and snuggle with these domesticated prehistoric Dire Wolf digs in the making" at the Project's headquarters. It all looks pretty nice, especially if you're in the market for a large pet and have a few thousand bucks to burn, but I'll be really impressed when someone starts selling pet dragons. Get on it, breeders!